This isn't the same Harry Nilsson that made "Jump Into the Fire" *or* "Coconut." Obviously. It’s pretty surprising that this album even got made. 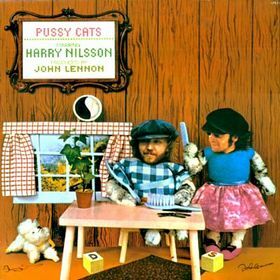 The principals involved–Harry Nilsson and producer/contributor John Lennon–had both hit hard times around the time of its recording. Nilsson, after break-out success in the early seventies, suffered a divorce and plodded aimlessly through sessions in the wake of A Little Touch of Schmilsson. Ex-Beatle Lennon, in the middle of a separation from Yoko Ono and stinging from the critical drubbing that greeted Somewhere in New York City, licked his wounds by dicking around in the Big Apple recording/fighting with Phil Spector over Rock ‘n’ Roll. On top of creative and interpersonal slumps, both men were drinking heavily and squandering huge amounts of time and no small amount of talent. Nilsson’s beautiful, multi-octave vocal range was mysteriously marred by a throat infection contracted from “sleeping on the beach.” Lennon seemed to be running on fumes, recording the songs of his idols instead of working on new material. The lifestyle was catching up. So, while expectations on a musical level were very high, especially when it came to outsiders looking in, the possibility of delivering an album that actually met those expectations wasn’t very strong. And the album doesn’t deliver like it should have…or could have. While a cut or two are spectacular (effective covers “Many Rivers to Cross” and “Save the Last Dance for Me,” downright melancholy “Black Sails”), the rest seem to be startlingly aimless time-killers (headscratchingly pointless “Subterranean Homesick Blues,” and “Rock Around the Clock.” I know Lennon was a big admirer of Nilsson’s voice and songwriting, but it’s as if Nilsson has utterly caved in to whatever boozy whim his buddy tossed into the mix in the absence of a game plan or compelling new songs. While a few tracks provide a tiny glimpse at the enduring greatness these sessions could have produced, the majority point to the reduced circumstances surrounding the main players. Happy and whole, the two pussycats could have made quite a convincing roar of a rock record. This album sounds like what it is: two sad-sack superstars sharing a Lost Weekend and chasing tail, drinking the pain away with no particular place to go. Don’t agree. Awesome album. Nilsson Nnows Besst. Thanks for the comment. I’d love to hear more of your thoughts.